This book on Rubber Technology summarises various aspects of natural, synthetic rubbers, vulcanisation mixing and calendering, manufacturing techniques of various rubber. The book is divided in two volumes. Volume I contains 1 to 22 chapters and Volume II has 23 to 39 chapters. 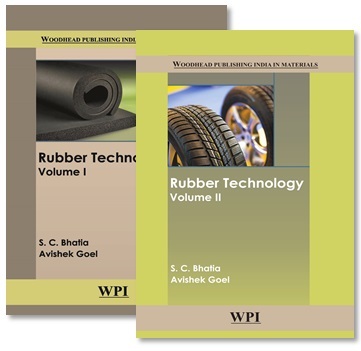 This volume discusses: basic concepts of polymerisation, natural rubber, synthetic rubbers: an overview, styrene butadiene rubber, polybutadiene rubber, polyisoprene rubber, butyl and halobutyl rubber, ethylene propylene rubber, thermoplastic rubber (Elastomers), chloroprene rubber, chlorosulphonated polyethylene rubber, nitrile rubber, polyacrylic rubber, fluorocarbon rubber, silicone rubber, thermoplastic polyurethane, PEVA, chlorinated polyethylene and ethylene acrylic elastomers, polysulphide, norbornene and polyphosphazene rubbers, materials for compounding and reinforcement, mixing and curing of rubber compounds, calendering, extrusion and molding of rubber compounds. A unique features of the book is chapter on chemistry and technology of vulcanisation.